Winter is Seville orange season. These brightly-coloured, bitter fruits make a brief annual appearance in British groceries for a mere three months from December. By the end of February, the gardens and streets of Seville with fallen fruit, and the supply to British supermarkets will have all but dried up. Take yr large orange & rasp them. Rub some salt all over them. Steep them in water 4 days & shift them every day. Take them & cut them in halves & take out all the clear as whole as you can & dont break the partitions. Then boyle yr peel till it is so soft as to run a straw through it. Take it out of the water & take out all the strings, but take out as little of the white as possible. Pound the peel very small. Take their weight of loaf sugar & dip it in boyling water & make it in a clear sirrop with whites of eggs, & boyle yr pounded peel & clear lumps in it very well. Then lay it up when cold for use. Jelly is made the same way, only leave out the peel & use the clear lumps instead. Seville oranges have been a familiar taste in English cookery since the late Medieval period. 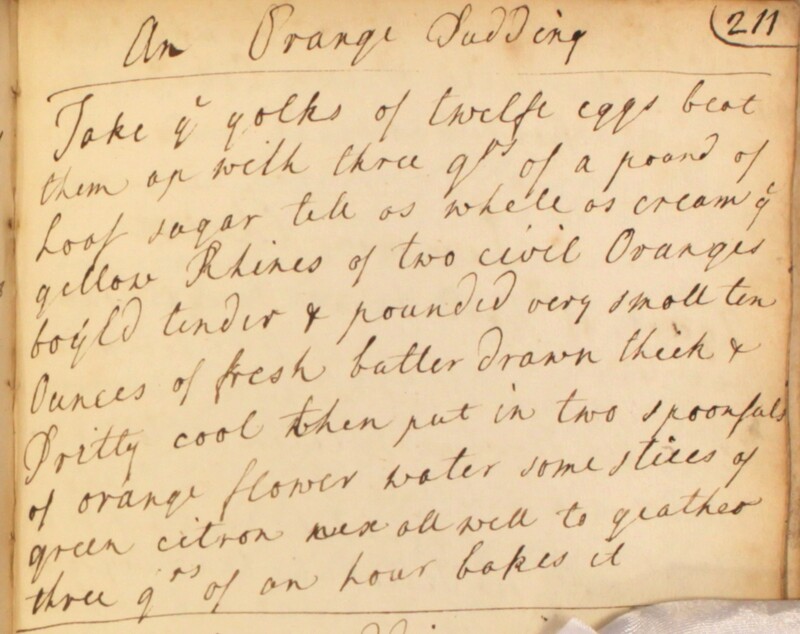 But it wasn’t until the mid 17th century that sweet oranges, commonly known as ‘China oranges’, became part of the English culinary landscape. Their sweet flesh contrasted pleasingly with the better-known bitter oranges of Spain, and they quickly became popular. 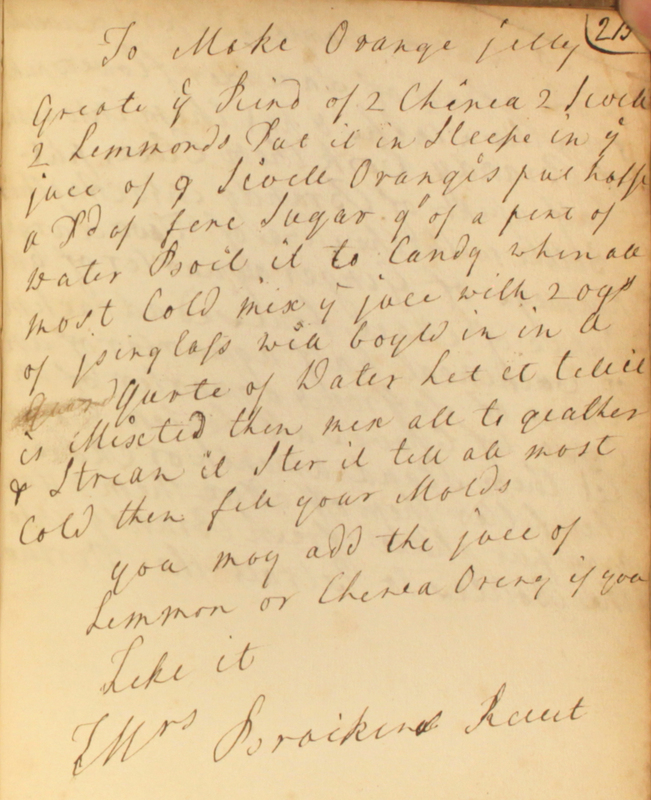 Bitter and sweet oranges were widely available in London from the late 17th century onwards. 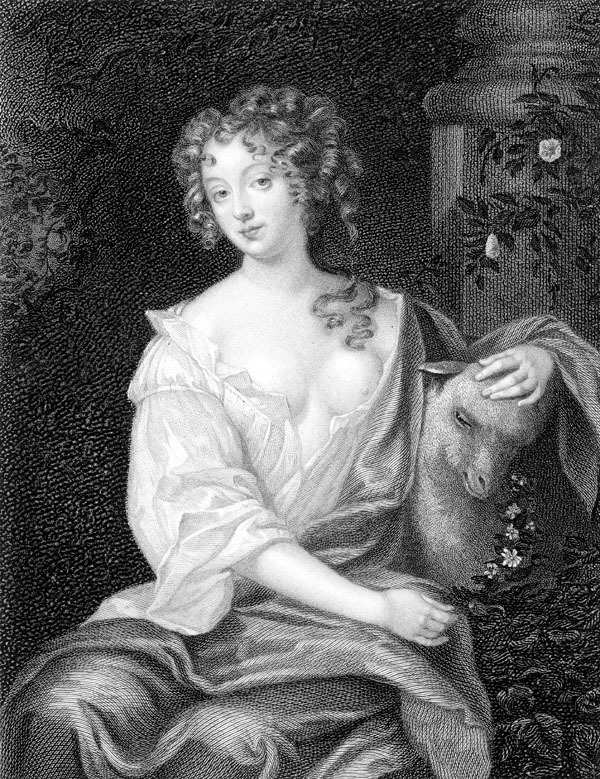 Nell Gwyn famously sold oranges at the Theatre Royal Drury Lane before taking to the stage, and orangeries sprang up at aristocratic houses across the country. 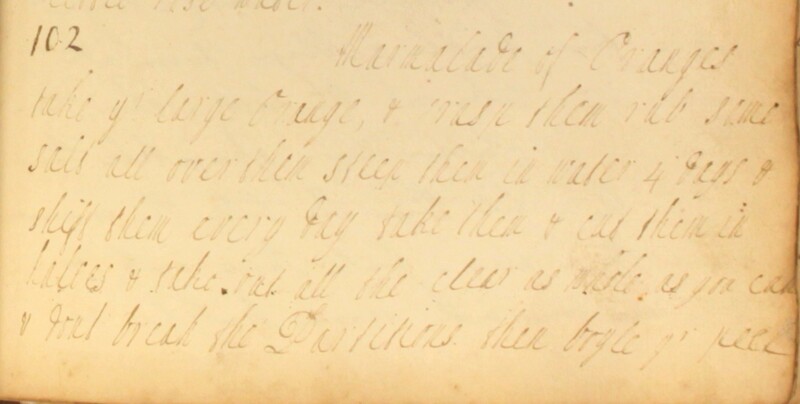 By the time our ladies were compiling the Cookbook, oranges were being grown in glasshouses on many landed estates. Grate the rind of 2 China oranges, 2 Seville oranges, 2 lemons. Put it in to steep in the juice of 9 Seville oranges. Put half a pound of fine sugar, a quarter of a pint of water. Boil it to candy. When almost cold, mix the juice with 2 ounces of isinglass well boiled in a quart of water. Leave it till it is mixed. Then, mix it all together and strain it. Stir it till almost cold, then fill your moulds. You may add the juice of lemon or China orange if you like it. Mrs Bracken uses Isinglass as the jelly’s setting agent. Derived from fish bladders, it has fallen out of common usage today, but is still sometimes used in viticulture to clarify wines. 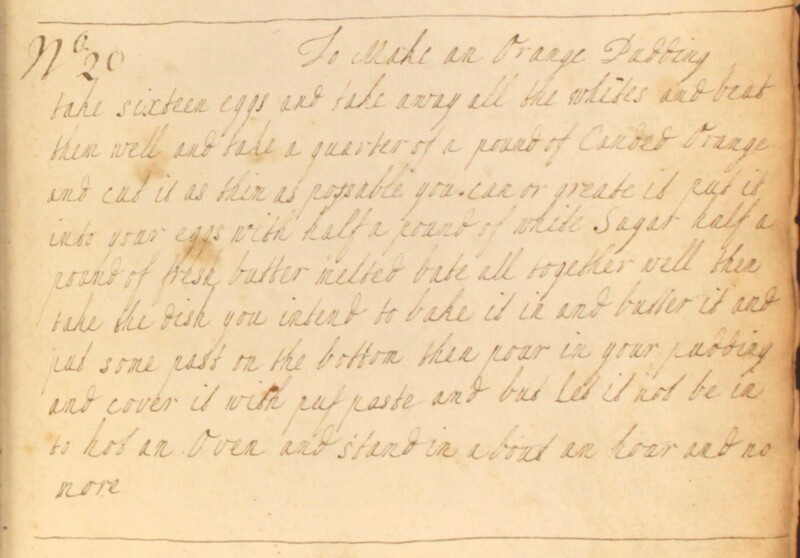 If you fancy making your own version of Mrs Bracken’s jelly, you might want to substitute it for gelatin. Fancy giving this orange jelly a go? If you do, make sure you let us know how you get on!